This blog contains Multiple Choice questions in Microbiology and related disciplines (Virology, Parasitology, Mycology, Bacteriology, Genetics) and Notes for all the related disciplines. Enumeration of microorganisms is especially important in dairy microbiology, food microbiology, and water microbiology. direct microscopic counts are possible using special slides known as counting chambers, consisting of a ruled slide and a cover slip. It is constructed in such a manner that the cover slip, slide, and ruled lines delimit a known volume. The number of bacteria in a small known volume is directly counted microscopically and the number of bacteria in the larger original sample is determined by extrapolation. Dead cells cannot be distinguished from living ones. Only dense suspensions can be counted. Bacteria can be counted easily and accurately with the petroff-Hausser counting chamber. This is a special slide accurately ruled into squares that are 1/400 mm2 in area; a glass cover slip rests 1/50 mm above the slide, so that the volume over a square is 1/20,000 mm3i.e. 1/20, 000, 000 cm3. If for example, an average of five bacteria is present in each ruled square, there is 5 x 20,000,000 or 108, bacteria per milliliter. A suspension of unstained bacteria can be counted in the chamber, using a phase-contrast microscope. Rapid, Simple and easy method requiring minimum equipment. Morphology of the bacteria can be observed as they counted. Very dense suspensions can be counted if they are diluted appropriately. Dead cells are not distinguished from living cells. Small cells are difficult to see under the microscope, and some cells are probably missed. A phase contrast microscope is required when the sample is not stained. The method is not usually suitable for cell suspensions of low density i.e. < 107 Cells per ml, but samples can be concentrated by centrifugation or filtration to increase sensitivity. with both the spread plate and pour plate methods, it is important that the number of colonies developing on the plates not be too large because on crowded plates some cells may not form colonies and some colonies may fuse, leading to erroneous measurements. It is also essential that the number of colonies not be too small, or the statistical significance of the calculated count will be low. The usual practice, which is the most valid statistically, is to count colonies only on plates that have between 30 and 300 colonies. The number of bacteria in a given sample may be usually too great to be counted directly. To obtain the appropriate colony number, the sample be counted must almost always diluted in such a manner that single isolated bacteria form visible isolated colonies , the number of colonies can be used as a measure of the number of viable (living) cells in that known dilution. Several 10-fold dilutions of the sample are commonly used. In most cases, serial dilutions are employed to reach the final desired dilution. However, if the organism normally forms multiple cell arrangements, such as chains, the colony-forming unit may consist of a chain of bacteria rather than a single bacterium. In addition, some of the bacteria may be clumped together. The development of one colony can occur even when the cells are in aggregates. i.e. cocci in clusters (staphylococci), chains (streptococci), or pairs (diplococci), the resulting counts will be lower than the number of individual cells. Each colony that can be counted is called a colony forming unit (CFU). By extrapolation, this number can in turn be used to calculate the number of CFUs in the original sample rather than number of bacteria per milliliter. The assumption made in this type of counting procedure is that each viable cell can yield one colony. There are two ways of performing a plate count: the spread plate method and the pour plate method. This method is used to count only live (viable) cells. A viable cell is defined as one that is able to divide and form off springs, and the usual way to perform a viable count is to determine the number of cells in the sample capable of forming colonies on a suitable agar medium. For this reason, the viable count is often called the plate count, or colony count. This method is used to enumerate bacteria in milk, water, foods, soils; cultures etc and the number of bacteria are expressed as colony-forming units (CFU) per ml. this method is used routinely and with satisfactory results for the estimation of bacterial populations in milk, water, foods, and many other materials. Its sensitivity (theoretically, a single cell can be detected), and it allows for inspection and positive identification of the organism counted. It is easy to perform and can be adapted to the measurement of populations of any magnitude. (3) colonies develop only from those organisms for which the cultural conditions are suitable for growth. A pour plate is a method of melted agar inoculation followed by petri dish incubation. 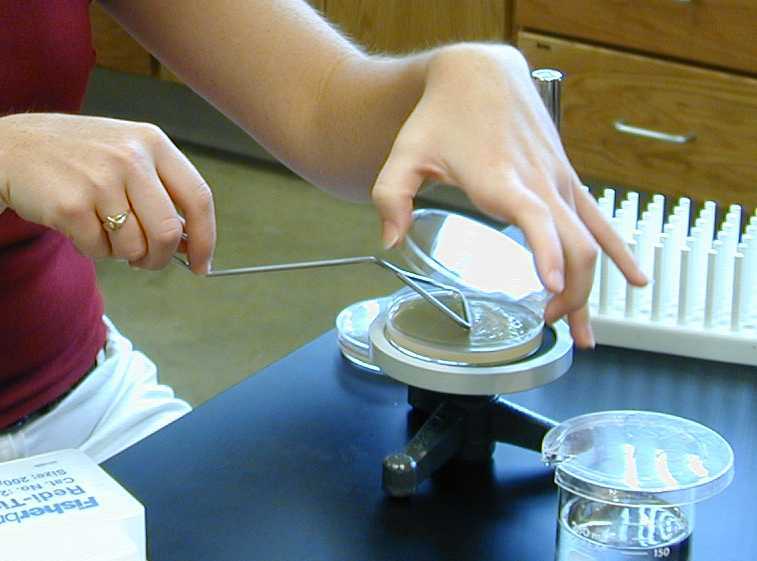 A known volume (usually 0.1-1.0 ml) of culture is pipette into a sterile petri plate; melted agar medium is then added and mixed well by gently swirling the plate on the table top. Because the sample is mixed with the molten agar medium, a larger volume can be used than with the spread plate. However, with the pour plate method the organism to be counted must be able to briefly withstand the temperature of melted agar, 45oC. The cultures are inoculated into melted agar that has been cooled to 45oC. 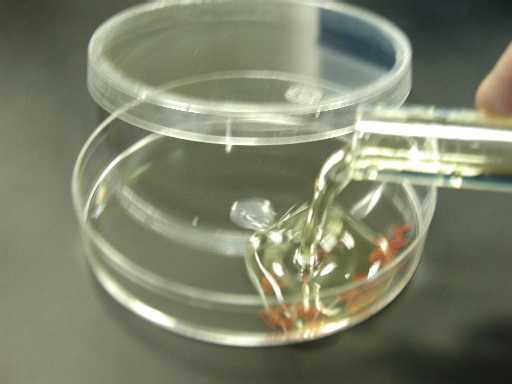 The liquid medium is well mixed then poured into a petri dish (or vice versa) Colonies form within the agar matrix rather than on top as they do when streaking a plate. Pour plates are useful for quantifying microorganisms that grow in solid medium. Because the "pour plate" embeds colonies in agar it can supply a sufficiently oxygen deficient environment that it can allow the growth and quantification of microaerophiles. Spread plate technique is an additional method of quantifying microorganisms on solid medium. With the spread plate method, a volume of an appropriately diluted culture usually no greater than 0.1 ml is spread over the surface of an agar plate using a sterile glass spreader. The plate is than incubated until the colonies appear, and the number of colonies counted. Instead of embedding microorganisms into agar, as is done with the pour plate method, liquid cultures are spread on the agar surface. An advantage of spreading a plate over the pour plate method is that cultures are never exposed to 45 oC (i.e. melted agar temperatures). Note: Surface of the plate must be dry, so that the liquid that is spread soaks in. volume greater than 0.1ml are rarely used because the excess liquid does not soak in and may cause the colonies to coalesce as they from, making them difficult to count. For organisms that grow well on agar plate, streak plate is the method of choice for obtaining pure culture. 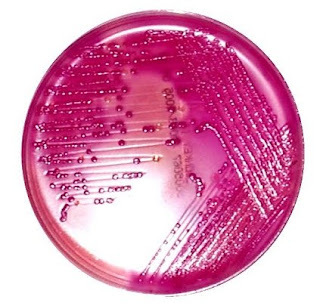 The key principles of this method is that, by streaking, a dilution gradient (number of cells decrease as they move across the agar and away from the point of inoculation) is established across the face of the plate as bacterial cells are deposited on the agar surface. Because of this dilution gradient, confluent growth occurs on part of the plate where the bacterial cells are not sufficiently separated; in other regions of the plate where few bacteria are deposited separate macroscopic colonies develop that can easily be seen with naked eye. Each well isolated colony is assumed to arise from a single bacterium and therefore to represent a clone of a pure culture. Purpose of Streak Plate Technique: The purpose of the streak plate is to obtain isolated colonies from an inoculum by creating areas of increasing dilution on a single plate. Isolated colonies represent a clone of cells, being derived from a single precursor cell. Many different streaking patterns can be used to separate individual bacterial cells on the agar surface. Methods of making a streak plate to obtain pure cultures. A loopful of bacterial cells is streaked across the surface of a sterile solidified nutrient medium. Following the initial streak, subsequent streaks are made at angles to it, the loop being sterilized between streaks. The plates are than incubated under favorable conditions to permit growth of the bacteria. After incubation colonies appear along the points of the streak. It is from such well isolated colonies that pure cultures can usually be obtained.